In the past few decades, cultural institutions in the West have increasingly felt pressure to return artifacts acquired through questionable means during the colonial era. While they have commendably repatriated many items to their countries of origin, their hands remain tightly clamped over some of their most prized acquisitions. One of the most patronizing arguments used by supporters to defend museums’ rights to keep such artifacts is that had colonial powers not taken these objects, they would have been destroyed in the conflicts and disasters that subsequently erupted in their home regions. And since these institutions preserved them, they have the right to keep them. 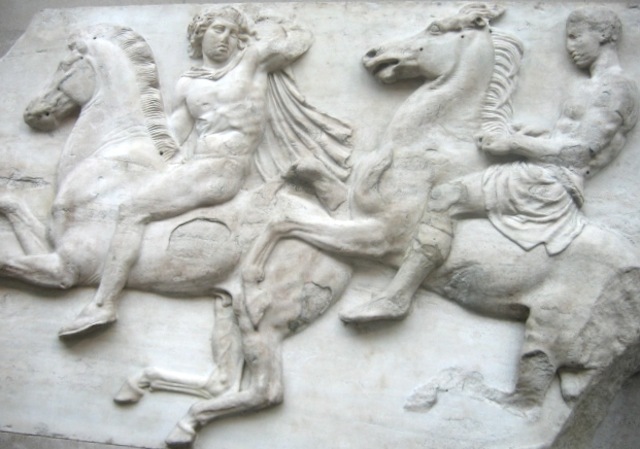 This argument is frequently reiterated in debates surrounding the so-called Elgin Marbles, which the British Museum purchased in 1816 from Lord Elgin, who hacked them off the Parthenon with the permission of the Turkish sultan who was occupying Greece at the time. And as The Guardian recently observed, the preservationist argument has also been spouted in the case of the same museum’s 6,000-items-strong collection of Indigenous Australian artifacts, many of them amassed during Britain’s occupation of Australia. In the past weeks, indigenous leaders in Australia have been demanding their repatriation and protesting the forthcoming exhibition, Indigenous Australia: Enduring Civilisation, which includes a shield dropped by a Gweagal tribesman during an attack by British soldiers. To continue trumpeting claims of historic preservation as a reason for keeping cultural heritage artifacts from the people to whom they matter most is not only insulting, it makes no sense at all. Some believe the evidence points to the contrary, as the sculptures that Elgin didn’t remove have survived intact and are now displayed in the Acropolis Museum in Athens. “If Lord Elgin had not taken the sculptures he instructed Lusieri and his team to remove, then they would still be there,” said Marlen Taffarello Godwin, a member of the British Committee for the Reunification of the Parthenon Marbles. The most damning rebuttal to the British Museum’s argument comes from those who believe Lord Elgin did more harm than good. “The argument is nonsensical because it is disputed whether Lord Elgin actually saved the marbles,” said Leila Amineddoleh, a partner at Galluzzo & Amineddoleh and the executive director of the Lawyers’ Committee for Cultural Heritage Preservation. She explained that some count the Englishman among the Parthenon’s desecrators, as his crew may have damaged the building while cutting off its metopes and frieze. What’s more, British Museum staff later bleached the sculptures, removing important details that include traces of color. “We saved the [Parthenon Marbles] for 2,300 years, and then Elgin came to Athens,” said Alexis Mantheakis, chairman of the International Parthenon Sculptures Action Committee. Since then, the sculptures have become one of the museum’s main attractions, with millions of visitors from around the world still flocking to see them every year. The British Museum’s refusal to let these works go suggests just how much the institution has benefited from them. It also implies that the same greed that fueled acquisitive colonialists still thrives in our greatest cultural institutions.